As demand for faster and more efficient development continues to build, containers are becoming an increasingly compelling option. However, many enterprises worry that containers will be too costly and complex to properly deploy and manage. Continue reading to learn about a validated deployment architecture created to help IT rapidly deploy, provision, and manage containers at scale. 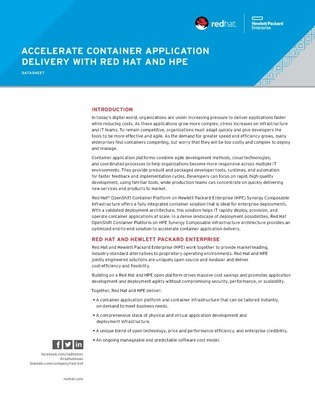 Built from a partnership between Red Hat and HPE, this open-source platform is designed to bring cost-efficiency and flexibility to application deployments.